Recently I’ve been working more and more with JDeveloper Extension Projects. When working with Extension Projects, you deploy to your target platform a lot. I’ve noticed that sometimes, your JDeveloper Platform gets confused with this and the extension you’re working on doesn’t load correctly. 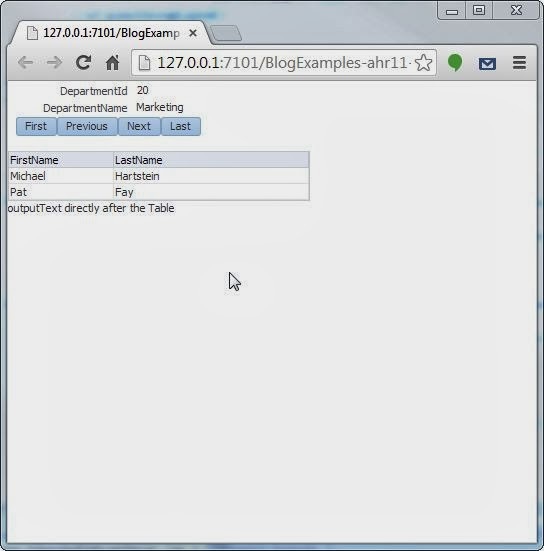 For example, you deploy your extension to the target platform, you follow this deployment in the log file and you see it got deployed successfully. After this, you debug the extension and wait for JDeveloper to start up. However, when trying to debug the extension, you notice something isn’t working. 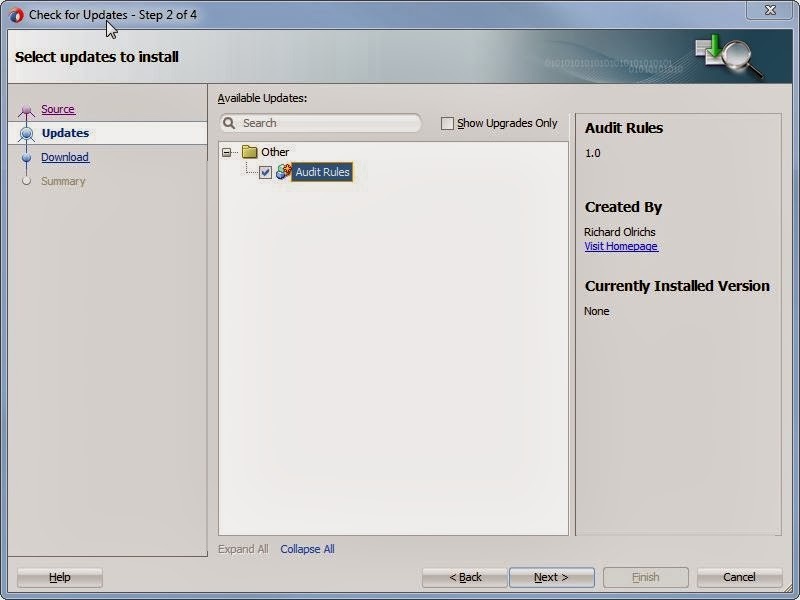 While working on the ADF EMG Audit Rules extension, I noticed that sometimes none of the rules where configured in the Audit menu under Tools -> Preferences. This means that the whole extension wasn’t installed correctly. In here, locate the extension you’re working on, and delete this jar file. In my case this was the ADF EMG Audit Rules extension. In here you see your installed extensions, but you should be able to locate a system_cache directory as well. Delete this whole directory. This is the system_cache of the JDeveloper you start when clicking 'Debug Extension', delete this system_cache folder as well. After deleting these directories, startup JDeveloper again and open your project. Don’t forget to deploy to the TargetPlatform again and after this run or debug your extension. This should’ve done the trick and you should be able to run your extension again. However, during the last few weeks, it happened to me one time that even this didn’t help and I had to delete the whole system folder instead of only the system_cache. You can delete this folder without any problems, because JDeveloper will recreate it for you, but you will lose your settings, preferences and configurations you made to JDeveloper or the integrated WebLogic server. If you created an extension project, you can share this with others by creating a zip file. However, there is a powerful mechanism in JDeveloper called Update Centers. 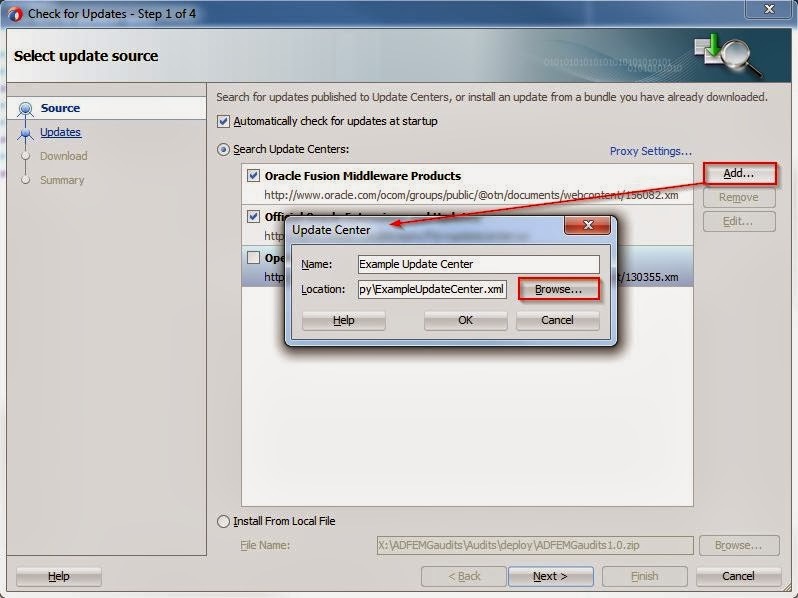 This blog will show you how you create an Update Center to share your own Extension Projects. In this XML file you configure some properties about your extension, like the name, author and the requirements. Most of this information you already configured in the Extension.xml as well. Enter ‘Extension Jar’ as name and choose ‘Libraries’ as Type. Go to the Contributors under Extension Jar and make sure the jar file is selected. Enter bundle.xml as name and leave the Packaging as Type. We’re now done with creating the zip file and bundle. You could share this zip and let other people install it on their JDeveloper. However, we rather distribute this through an update center. Typically, you want this zip file on a network drive or on the web, but in this example we’ll leave it locally on the computer. The general idea is the same. Now we’re going to create the update center, this is a simple XML file, you can create this anywhere on your file system. 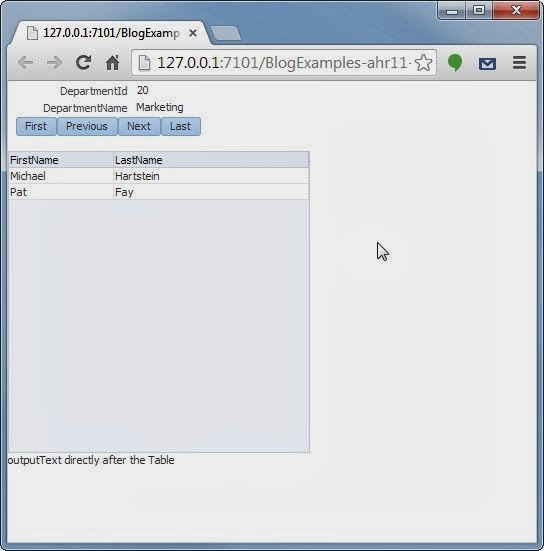 It looks a lot like the bundle.xml that we created, with the exception of a location being presented as bundle-url. This is pointing to your zip file, in this case I left the zip file in the deployment folder. Enter a name and browse to the created XML file and click OK.
You’ll find your extension here, if you click next, you see it is under the New installs. Now press Finish and after the popup for a Restart press Yes. After JDeveloper has been restarted, your plug-in has been installed. Update the bundle version to 2.0. Update the version of the update to 2.0. Redeploy to create a new zipfile (also a 2.0 version). Update the bundle-url to point to the 2.0 zip. Here we see the new version of our Audit Rules, version 2.0. Now, without distributing the new zip file again, anyone who has installed the update center, will be able to get the 2.0 version of your Extension project. 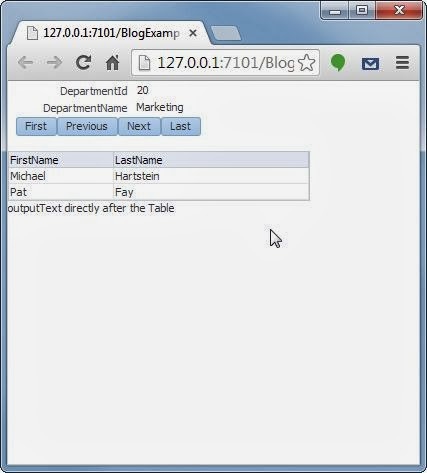 Our use case was to have a table displaying data, with under this table some content. The content needed to be directly under the last table row. 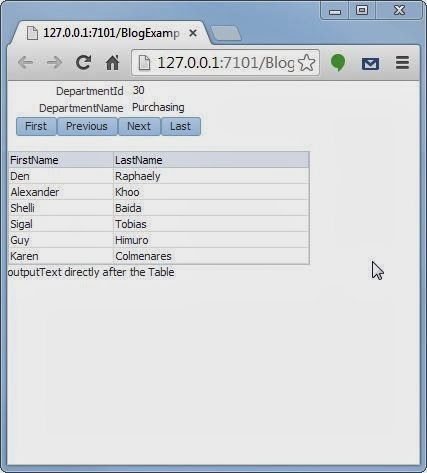 In ADF 12c this goes a lot better, but in ADF 11g, the table takes up some default space. Over the last few weeks, I gathered and produced more and more info about Audit Rules, JDeveloper Extension Projects and other stuff related to creating Audit Rules. I will try to keep this page up to date. Feel free to let me know if I missed anything.